4 March 2016, ©. Leeham Co: There is a saying, “There’s more than one way to skin a cat.” The same goes for making successful Turbofans to commercial aircraft. At the recent Pacific Northwest Aerospace Alliance 2016 sub-supplier conference in Seattle, GE, Rolls-Royce and Pratt & Whitney all talked about their latest engine projects and the technology development that was critical to their success. The engines they talked about, the GE9x, Rolls-Royce Advance and Pratt & Whitney’s Geared Turbofan, can all be characterised as the best of breed for their intended use but they could not be more different in how their level of excellence is achieved. It made for interesting listening. Here’s the gist of what was told. Jason Brewer, General Manager, GE Aviation Technical Marketing, described the work and technologies behind GE Aviation’s new engine for the Boeing 777X, the GE9X. The GE9X builds on the architecture from the successful GE90, employing a range of new technologies to achieve efficiencies that hasn’t been attained before. The GE90 in its latest incarnation, the ones for the 777-300ER and -200LR, is an efficient Turbofan. The GE9X increases this efficiency level a further 10%. To get there, several industry firsts were needed. 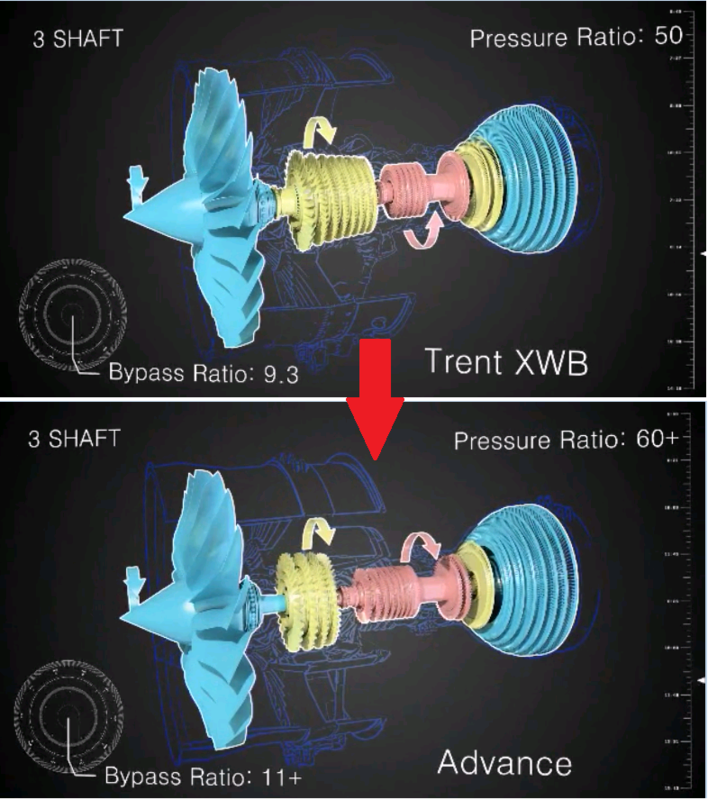 The GE9X will be the first engine to pass an Overall Pressure Ratio of 60:1. To achieve that level, GE had to develop a high pressure compressor of 27:1 pressure ratio achieved over 11 stages. An average stage pressure ratio of 1.35 is an industry first for a turbofan. Brewer described the extensive work at their compressor testing facility in Massa, Italy, where the correct functioning of this complex compressor was verified. 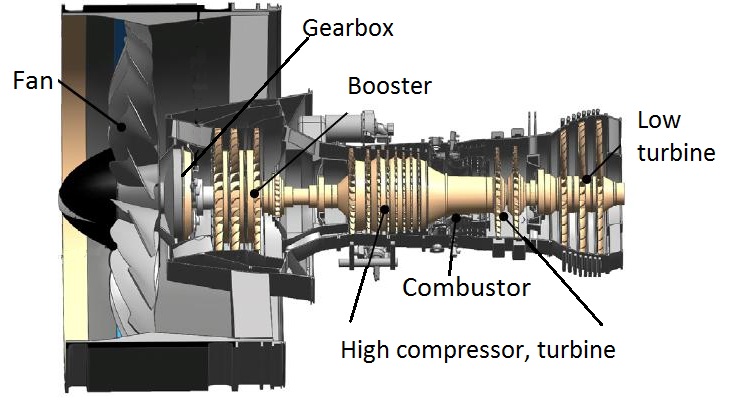 To drive this compressor at take-off power, a turbine of 130,000 hp is needed. This requires a two stage turbine with very high temperatures and which employs advanced cooling techniques. To minimise the cooling needed, Ceramic Matrix Composites (CMC) is employed in the two high pressure turbines. This material can withstand higher temperatures than Nickel Alloys and therefore require less cooling air to be zapped from the compressor. The high pressure and temperatures in the engine’s core generates high levels of NOx in the combustor if nothing is done to stop these from developing. GE has developed a two-stage burner called TAPS to control this process. The mixture of air and fuel is done before the combustion, in the fuel nozzle, to allow a flame that generates low NOx levels. This requires a complicated build of the nozzle, with many parts. For the GE9X, the complex form is achieved in one step by means of 3D printing the nozzles. To lower the need for cooling of the combustor, CMC is used in the combustor’s liners. GE9X will also be the first engine to have a fan diameter over 130 inches. The final design went to 133.5 inches. To control the weight of such a massive fan, Carbon Fiber Reinforced Plastic (CFRP) is used both for the fan blades and the fan case. To let the maximum of air through the fan, it’s made up of only 18 blades, down from 22 for the GE90. Rolls-Royce’s Richard Goodhead, SVP, Customer Strategy & Marketing described the work Rolls-Royce is dong for the Advance project. Advance is a technology demonstrator engine which introduces the biggest changes ever made to the company’s three shaft engines. The idea is to change the work division in the engine. In RB211 and Trent engines to date, a large part of the compression work has been done by the intermediate pressure (IP) spool. Part of this work is now shifted to the High Pressure (HP) spool in Advance. Rolls-Royce change of work split between spools in Trent engines versus Advance. Source: Rolls-Royce. A key challenge for three shaft engines is managing the thermal situation for engine bearings for the third shaft. By offloading the IP spool of work, the third shaft bearings get an easier life. The new, more powerful high pressure spool is needed for the company’s next project, the two spool Ultrafan geared architecture engine. The Advance thereby does not only serve the purpose of generating an advanced tri-shaft engine, but it also verifies the technology behind the companies new core architecture for the Ultrafan. The Advance would be the first engine to employ Rolls-Royce’s CFRP fan and fan case technology called CTI. CTI used resin infusion into a 3D woven carbon fibre structure (similar to the LEAP) instead of the hand layup method that GE is now tuning for the GE9X. To prove the Advance’s new core, Rolls-Royce will have a demonstrator engine running on a test stand summer 2016. This engine will be made with existing components outside the core and be in the 75,000 lbf class. The front with the fan will come from the Trent XWB and the rear, including the low pressure turbine, will come from the Trent 1000. Between these parts will be the new Advance core where the principle challenges are for the new design. The Advance core will further develop the pioneering work that Rolls-Royce has done in controlling the cooling flows for the engine’s hot sections. The company was first with throttled cooling of the high pressure turbines and is still the only one employing a fluidistor control valve for the throttling (a valve where the main airstream is control by a weaker pilot airstream). Rolls-Royce is also planning to employ CMC in the demonstrator, the first applications being new types of seals and hybrid bearings. 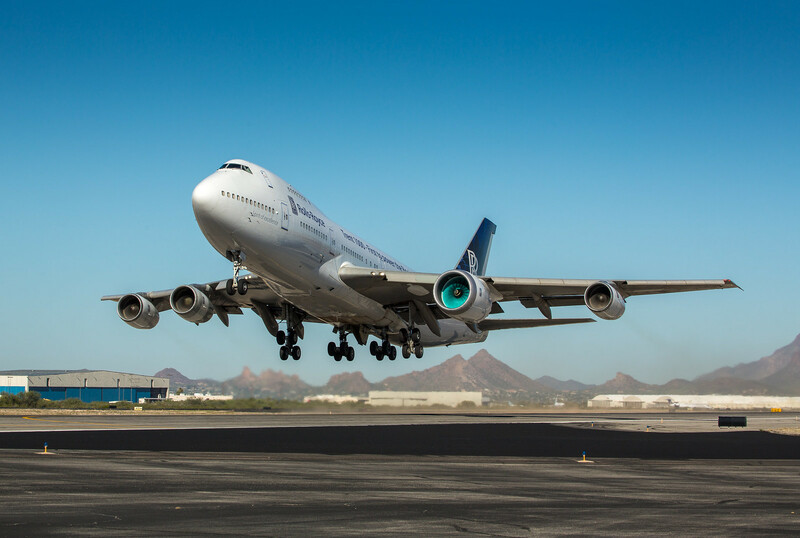 The subsequent demonstrator program for Rolls-Royce will be the Ultrafan program which will also include flying engines. A curiosum is that Rolls-Royce has decided to call its Ultrafan two spool engine’s low spool the “IP spool”, for intermediate pressure spool. They thereby emphasize that it’s a fast running spool with elevated pressure gains over the stages. Everyone else in the industry call this the low pressure spool. Rolls-Royce might even classify the geared fan stub shaft as the engine’s third low speed shaft. It has tricked many to classify the Ultrafan as a three shaft engine. This would only be true if one classify the slow running fan shaft, from the gearbox forward, as a separate shaft. But then every geared turbofan in the world is a tri-shaft engine. Geared Turbofans turns us to Pratt & Whitney (PW) and the presentation from Senior Marketing Manager Paul Burke. Burke presented the advantages that a geared architecture gives an engine manufacturer. The principle has been known for a long time: the fan spins at its ideal speed (around 4,000-5,000 RPM), the low spool at its optimal speed (around 12,000-15,000 RPM) and finally the high spool at its ideal speed (more than 20,000 RPM). Pratt & Whitney’s Geared Turbofan PW 1100G. Source: Pratt & Whitney. By putting a 3:1 gearbox between the fan and the low speed spool, each can be optimized without needing compromises for its ideal blade speeds. The result is an engine which easily can be given a very low fan speed without compromising the booster. Together with a low fan pressure ratio, this allows the air to be accelerated to less over-speed through the engine. The low air speed has to be compensated with a large fan, giving a high By Pass Ratio (BPR). The result is higher propulsive efficiency for the engine. At the same time, the compressors and turbines which are needed can be constructed with a fewer number of stages and blades, as each stage has a higher effectiveness (it spins at optimal speed). This has positive effects on weight, build and maintenance costs. The drawback is that the engine needs a bulletproof 30,000 hp gearbox, one that should never fail and need no maintenance. It took Pratt & Whitney 20 years to develop and prove this piece of the engine. The gearbox adds cost and weight to the engine, but Pratt & Whitney claims that the sums still add to lower weight and costs than a direct drive design. A bonus of the design principle that has not been talked about so much is the fact that the gearbox shifts work from the high spool to the cooler low spool. With a faster spinning booster compressor (the one behind the fan on a direct drive engine and behind the gearbox on a geared engine), it’s part of the Overall Pressure Ratio (OPR) increases. This means the high pressure compressor has less work to do which alleviates the stressed high pressure turbine. Work is therefore shifted to the low pressure turbine where it’s easier to accommodate. The geared architecture is nothing new in the Turbofan industry. Its advantages and challenges have been known for decades (as I written before, my jet trainer had a geared turbofan engine and that was 1970!). Pratt & Whitney should be credited with taking the principle to new thrust levels, for making it known to a broader public and for perfecting the technology. PW has designed their PW1100G gearbox as a lifetime item with no scheduled maintenance (other than changing oil). IMU (average) pressure ratio per stage is 1.35 (11th root from 27) ? Or do I make a mistake here ? 2.5 per stage is nearly twice of what established tech provides. Overall ratio is the product (and not sum) of individual ratios. Consequently, mean ratio is the geometric mean (27.5**(1/11. )=1.35) and not arithmetic mean (27.5/11=2.5). Mia culpa, thanks guys, corrected! Ironic how the Rolls advance engine is resembling a typical large 2 spool engine, relatively few low pressure compressor stages, followed by a high pressure one driven by a 2 stage high pressure turbine. . I count 16 blades on the drawing of the 9X. But maybe they found out that they need two more and have not updated the pictures of their presentation? If you compare the GTF and the Advance you find their cores appear to be very similar. So for me RR is clearly working its way towards their own geared engine. I think the Advance is only the bridge to the Ultrafan, maybe they will not even develop an Advance for an actual plane. Me thinks it is the Ultrafan that the A380NEO is waiting for. 16 is a number you can divide many times by 2. Maybe to much resonance. I would have preferred 17. Less blades means less ‘fan blockage’ ie more room for air to go through and at a lower pressure ratio. All large fans have an even number of blades, this permits replacement of a single damaged blade with a matched pair of blades without need to rebalance rotor. You are correct, 16 blades vs. 18 on GEnx and 22 on GE90. You can count the blades in the rendering, 16! Another feature of the front fan thats interesting is the blade leading edges are now steel rather the titanium of the GE90 and GEnX blades. Seems to be a less advanced solution ? Another good image is showing a single blade alongside a crouching person. RR’s Advance is a three spool engine, with all the advantages that brings (easier compressor design, fewer variable stator stages, shorter, etc). The third shaft allows for independent optimisation of fan speed and compressor spool speeds. GE’s two shaft architectire has a compromise – the LP compressor has to run at fan speed, and one of them ends up being compromised. RR’s Ultrafan is a two spool engine with a gear box driven fan. This has very similar advantages to a three spool, but with some improvements (fewer hot-end parts, better optimisation of fan and turbine speeds, etc). P&W have done very well to get this working, in effect bring the advantages of a 3 spool design to a smaller, two spool engine. What would be really cool is a three shaft engine with a geared fan. That’d be 4 separate speeds of rotation in one engine! Lets not forget the most important feature of RR’s CF blades. They’re thin, thinner than GE’s CF blades. That’s quite important – you don’t want thick, chunky blade roots getting in the way of air flow into the core. I’ve read elsewhere that this is one of the reasons why RR have stuck with titanium this long – they didn’t want to compromise blade aerodynamics simply to save a bit of weight. There’s another reason for RR holding back on CF fan blades: memory. The original RR company went bankrupt back in 1970, when a VC10 with one of their original RB211’s flying over Lake Natron met a high-flying flamingo. Bad news: the bird got minced; the CF blades delaminated; the company went bankrupt. They’re making VERY certain it doesn’t happen again. How do I know this? I was an RR apprentice at the time – and we all got laid off in the bankruptcy. I wonder about the RR Ultrafan. The idea is to make the fan blades pitch adjustable, even deleting the thrust reversers. A very ambitious first, maybe too ambitious? Did RR discuss lately? Where is the air for fan thrust reverse coming from at 180 kts.. I now remember from loooong ago T56-A-14 had the root propblades providing positive inlet pressure for the compressor while the outer blades provided thrust reverse. That’s probably the concept for the Ultrafan. Interesting CFD modelling no doubt..
As Leeham’s has suggested elsewhere, bolt four of those onto an A380 and that’s a neo. One wonders how good a 747 with four of those under the wings would be (wing loadings permitting). It’d sure get up in the air quickly! A reversing fan is certainly ambitious. What was once a solid lump of metal (the hub) becomes a fiendishly complicated piece of mechanical machinery. I guess that with modern load analysis and manufacturing it would be possible to get it right, or at least be confident in getting it right with not too many iterations. I think that what’s more important fan pitch as well as speed could then be optimised for different phases of flight. That in turn helps the power turbine – it could be run at its optimum speed more of the time, with fan pitch changes contributing to changes in thrust. The air comes from the back. It won’t have to form a vacuum behind the fan cowling! Anyone care to comment on which company’s innovations will be easiest and hardest for their competitors to emulate as they all strive to improve efficiency? None of these technologies are easy to master, which is why every one of the big three has had to make a decision which way to go and which project to get at first. But as we have seen in the past, eventually they will all get there or die trying: Carbon fan with wide 3D-blades, full carbon case, gearbox, CMC’s, 3D-printed injection, advanced cooling,.. you name it. The race is on. Its not really ‘3d printing’ as is popularly understood, ie additive layers are injected onto the product which is built up. the you have the UV selective polymeration resin stuff. and a range of obscurer methods. I would expect all 3 to converge on similar levels of technology eventually. It is just that they each seem to have a different starting point to get there. RR’s UltraFan seems to be the first concept that puts together GTF, CFRP fan and CMC technologies together in one package. Throw in the innovative bit of tech that does away with the thrust reverser as well. The big question for me is how fast can RR design and build their gear. It looks so simple, but there must have been a reason why it took PW 30 years to figure it out. Or maybe they have not really been working on it so hard but some lately available materials and technologies have made possible what had been a total fail with the superfan for the A340 in 1987? Maybe GE will pull a geared engine out of their hat as soon as they have the 9X on its way. Just think of the 797/MOM. Would GE really let PW have that plane again, just like the 757? Would the Advance be good enough for that plane? Didn’t GE just recently buy P&W’s gearbox manufacturer ? GE Avio formerly Fiat Avio was the IAE partner on the GTF, with responsibility for the gearbox. You would have thought this little fish would have been in UTCs corporate sights rather than wasting its time on a whale like Honeywell. My biggest question is, even with all these promising new tech development, whether any one of the 3 engine makers will fail to find an application on Airbus/Boeing programmes or whether we will return to an era where engine choice is commonplace. Especially when it comes to widebodies. By the beginning of the next decade, we’ll have 4-5 WB programmes, out of which only 1 will have a choice of two engines. Would anyone like to comment on how easy or hard it would be for A or B to specify a standard interface (mech, elec fuel) etc on the wing and a thrust, weight and CG range and to insist that all three engine makers conform to it, regardless of their design, who makes the nacelle or whether or not they have thrust reversers etc. That in principle allows all three to offer an engine. This is a volume market and there should be quite enough volume for all three to share. There are certification costs, of course, but why else might A or B not choose that route? Firstly the engine is attached to the wing by the pylon , so it is in a sense a standard fixture but can be unique for each engine. This has happened to the 787 for GE and RR engines, so in theory the engine ( with its pylon) is interchangeable. Volume business doesnt really describe it, as the capital costs are huge, development ongoing and competition massive. And even with all that risks are still substantial which can be mitigated with exclusive commercial arrangements. What is interesting is the latest NASA stu8dies all show that the configuration with the highest fuel burn improvement is the GTF. Anyway, the stretched A350 is a no-brainer, and the only question was when it would be launched. The A350-1000 growth option was decided in 2010 when Airbus re-specified the wing, engines and landing gear for a future MTOW boost. From a salespoint, it’s the value of being able to offer -1000 customers a future growth scenario. The -1000 apparently needed that. Is there a length limit like there is for wingspan (80 m). will they make a larger wing to match the 779 range or have a reduced range aircraft like the 8710? I’d guess that the A350-8000 will be stretched by 9 fuselage frames over that of the A350-1000 – five frames ahead of the wing and four frames aft of the wing. Nine fuselage frames is equal to 5.715 m, i.e. one frame is equal to 0.635 m or 25″. In fact, a five frame stretch between Doors 1 and 2 is the maximum stretch possible in the forward fuselage without exceeding the rule saying that; “no passenger emergency exit shall be more than 60 feet** from any adjacent passenger emergency exit on the same side of the same deck of the fuselage, as measured parallel to the airplane’s longitudinal axis between the nearest exit edges“. Like the 777-9, the A350-8000 will have two type C exits between Doors 3 and 4. Hence, the length of a nine frame-stretched A350-8000 fuselage would be 77.965 m (i.e. 72.250 m + 5.715 m), while the overall length would be 79.5m (i.e. 73.79 m + 5.715 m). Also, nine frames is about equal to 7 rows at 9 abreast and a 32” pitch; or 49 seats. Two type C exits would reduce that number by 4 or 6 seats. It’s interesting to not, however, that a nine frame stretched A350-8000 would have enough space for 52 LD3 containers on the lower deck. In contrast, the A340-600, A350-1000, 777-300ER and 777-9 can carry, respectively, 42, 44, 44 and 48 LD-3 containers on the lower deck. Therefore, I’d not be surprised if the A350-8000 would be offered with both lower deck lavatories and a galley – or similar to the Lufthansa A340-600* configuration (i.e. lavatories + galley = 10 LD-3s). Finally, in contrast to the 787-10 which will have the same MTOW as the 787-9, the A350-8000 will have, at least, an 11 tonne higher MTOW than the A350-1000, which would seem to indicate that the A350-8000 will have a significantly longer range capability than the 787-10. As we all know the next new plane from Boeing will be the 797/MOM. No doubt it will have a geared engine. Maybe a larger version of the PW1000G. But I would not be surprised if GE would to try win that deal with a new engine. The next project from Airbus will be the A380NEO. Most probably with a RR Superfan engine. What then? New engines for the 787 and the A350? An even larger Superfan from RR, an entirely new engine from GE or maybe PW will go big with an PW2000? Any competition for a MOM requires a new engine. Per the studies, it has to be a GTF. Neither GE or RR are close to a GTF. RR and their so called Ultrafan is 2025. GE has no stated GTF solution (though there has to be work being done on it). Why RR would come out with an Advance engine then negate it with a GTF Ultrafan is a mystery to me. It looks like GTF has to be part of the tool set for any competitive engine going forward. P&W is obviously going to scale up their GTF and no longer base anything on previous engines (RR has been basing theirs on the RB211 forever). The only mfg with a future growth technology and engine close to ready to go is P&W. Nothing else is there, even if RR and GE went full boat with all the rabbits pulled out of the hat to get close to even and see it fall away as the GTF improves further. P&W has already stated it has changes planned for any new version that takes more advantage of the GTF than they do now and the current GTF is improving as well. And does Boeing want to do a 797 with only one engine choice? Re engine for the 787 or the A350 might be down the road, as they were designed with fuel prices in the 70+ range I have no idea what price might trigger a change, 10+ years from now? Interesting engine times as well as airframe. hello CF6 from 1964 ,CFM56 from the mid 70s,and GE90 from 1990. Foe RR all thats left is the 3 shaft architecture. If we compare RR and GE it looks like the high pressure spool of the GE engines is much better suited for a geared fan than the Trents. That is why I expect GE to outpace RR in the race to a larger GTF. Don’t forget that RR’s 3 spools gives their engines many of the properties that P&W’s GTF has. The reason RR have based their designs on the RB211 forever is because it’s a very good architecture. It’s taken them from being a “Who?” to a significant share of the world market! I think the reason why RR are doing Advance is because it’s relatively easy for them to do it. It’s a moderate change to their current design whilst, as the article outlines, setting the scene for GTF (the HP compressor design). Bolting on a CF fan is another sensible, low risk move. There’s some subtlety to RR’s decision to go to a CF fan now. Previously they’ve avoided it because they couldn’t make them thin enough to achieve the aerodynamic efficiency they’ve wanted. Now that they can get them thin enough there’s a lot to be gained. With CF it’s easy to make almost any shape they like. In contrast titanium is quite difficult to mold into shape (though they’ve been very clever with that). CF gives them freedom of aerodynamic form and means there’s lots of room for optimisation. And as well as bringing the obvious weight savings in the fan, the compressor doesn’t have to do quite so much work, meaning there’s less hot-end stuff, etc. The knock on effects are quite significant. In comparison GE haven’t got quite so much room for optimisation – their fan blade roots are quite chunky. For me the one’s who are going to get caught napping are GE. They’re sticking to the same old architecture, using the same old fan blades, and are making everything bigger, hotter and more stressed to keep the architecture competitive. Absolutely everyone knows that a 2 spool design is at a big disadvantage. 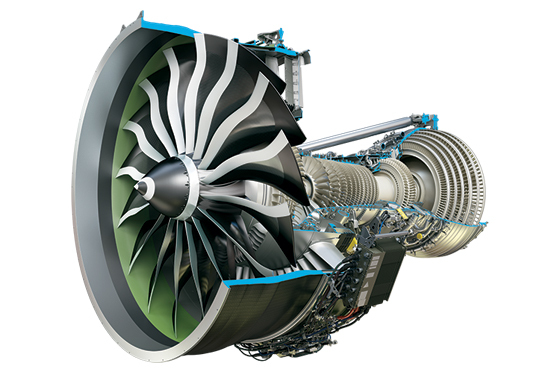 If GE made architectural changes too, they could come up with a truly formidable engine. P&W have done very well to get GTF going – a big gamble, and it gives them an excellent opportunity to get back in the large engine business. RR are being very ambitious with three major areas of development – CF fan with thin blades that should be a big step-up beyond GE’s, variable pitch and GTF. These are big architectural changes, and they have 3 spool in the bag which they’ve been dining out on that one for 40 years. And they’re also playing around with CMC, etc. They don’t need all of these changes to succeed all at once in a single engine – bringing them in as-and-when makes for an attractive proposition. If I were in RR’s shoes I would never underestimate a competitor like GE. Take a second look at their high pressure spool and you will find that it is exactly what is needed for a GTF. Then they purchased the producer of Pratts gear. Why would they have done that if they are not working on a GTF already? They have extensive experience in carbon fans. My thinks they are really only one step away from their large GTF. Probably keeping it top secret to not disturb anybody. RR has more on their plate. A concept for a gear and a carbon fan and a suitable high-pressure spool is not yet a finished product. I think their decision to start the Advance and Superfan was a good one and I hope they will manage it well, but I don’t think they are ahead of GE. For me the big unknown is Pratt. Will they stick to smaller engines for now, maybe just growing it a bit for the 797? Or will they develop an 100% new engine to compete with GE and RR on the larger versions too? It could be that the fantastic success they are going to have with it will keep them completely busy in this range. Oh I think RR take GE’s abilities very seriously indeed. I’ve heard several RR seniors talking publicly to that effect. What’s really, really nice is that both companies (and PW too) are very public about joint cooperation and mutual assistance in matters of safety. We all benefit from that. I guess then that GE are closer to a GTF, but they are keeping very quiet about it. I hope PW got the IPR terms in the contract right! If they want to sell GTF engines in, say, 10 years time they need to be talking to customers about it now-ish. And maybe they have been doing so in private. I think that GE’s current experience with CF blades needs to be updated quite quickly. RR’s are probably going to be better (i.e. thinner) and a lot cheaper to make. All other things being equally that would give RR a market edge. RR’s CF blades are seemingly a done deal. Presumably RR could (though they’re not saying so) also offer CF fans as an in service upgrade to existing engines; that would be an interesting quick win for existing Trent operators. Here’s a wild idea: RR buy/merge with P&W? I no longer believe Boeings next project will be a MoM as discussed sofar. Maybe a small MoM, from 150 seats up. Maybe the MAX is doing worse then absolute sales numbers suggest. How solid are the 650 undislosed and 750 leased ones, rocksolid? How are the margins? General wisdom is that Boeing has the (significantly) higher quality orders/customers. There is a very difficult decision to be made at Boeing regarding the next plane (797): Make a true replacement for the 737 (and admit defeat by the A320) or stick to the idea of a somewhat larger plane that can outperform the A321 and replace all 757s. Such a plane would probably have a body similar to the MS-21. Boeings announcement to keep the 737-7 alive supports the second scenario. It appears almost impossible to make “good” 3 versions out of a plane with only one wing and tail etc. (as we have repeatedly observed). So maybe there will be the cheap, short to medium haul 737-7 and -8 and then a new 797-M (A321-size) and -L (757-300 size) with carbon wings and alle the goodies.